Company's promoters know all the basics and technicality of pure and deshi ghee as their forefathers started this business 100 years back, hence the research on ghee has been going on since that time. We know what is pure and deshi ghee because of having 100 years of research knowledge. We collect milk for ghee production from the Cattle whose milk is pure as they live in natural environment and remains free from pollution, disease and hormonal injections and with the mix of old tradition and new technology ghee has been manufactured at our most latest plant in Hajipur without comprising and affecting the local deshi taste unlike others. This is the reason we say "Swad... Jise Bhula Na Paye". It is available in 15kg, 1Kg, 500ml tin packing and 250ml pet jar packing. • Pure Deshi Ghee has excellent nutrition for skin & eyes, helps fight obesity, ageing and cancer. • Ghee can be consumed for better digestion. 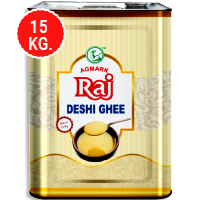 • Deshi Ghee stimulates muscle movements, nourish skins and improve complexion. • Ghee is a good source of energy and provides vitality to Human body. 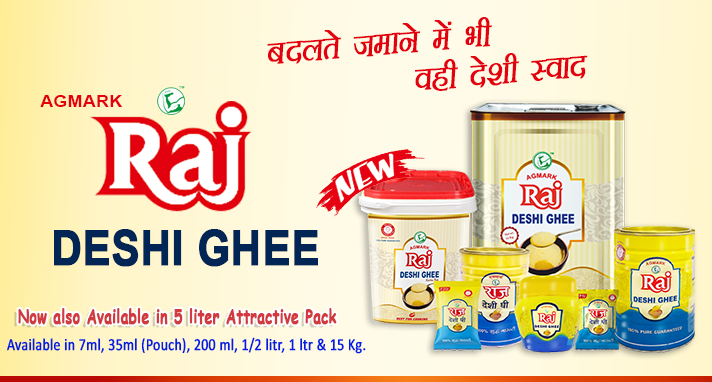 • Finally Raj Deshi Ghee makes your food more and more Tasty. • Enjoy the taste and aroma , Spread it on Roti,Topping in Rice, Dal, Paratha, Sweets etc. Anuj Dairy Manufactures High Quality Skimmed Milk Powder (SMP) at its most modern plant, which is equipped with latest technology. Keeping quality in mind we collect fresh milk directly from farmers and societies and then process it for SMP after rigorous lab testing. Raj Fresh SMP is completely a free flow powder with high quality granules textures and pleasant flavors. It is rich in protein (approx 36) and highly soluble in water. It is ideal for Khoya, Chhena, Curd, Sweets, Ice-Cream and also for drinking as Fat Free Milk. 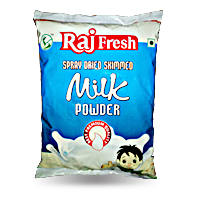 Raj Fresh SMP is available in local market for general consumer and also we are supplying to bakery, confectionary & other dairy companies. It is available in 25 KG bag and 1 KG laminated packet. COPYRIGHT © 2012, ANUJ DAIRY PVT. LTD.